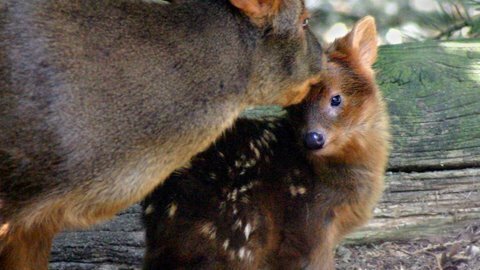 A baby pudu was recently born at the Woodland Park Zoo. A baby pudu was recently born at the Woodland Park Zoo in Seattle. Pudus are the smallest deer species in existence and are native to tropical forests of South America. Our friends at the zoo were kind of enough to post a video of the little guy to YouTube, which is sure to elicit a great big “AWWWWWWWWW!” from anyone who watches it. Enjoy the video below and the warm fuzzies you’ll surely feel from watching it, and be sure to check out National Wildlife Federation’s very own Wild Animal Baby for the kids in your life.